The border lands between England and Scotland were divided into six marches. Three on the English side: The West March (Carlisle), The Middle March (Hexham and Norham); The East March (Newcastle and Berwick) and three corresponding marches on the Scottish side. Each march was administered by a Lord Warden and his deputy as well as other officers such as land sergeants. The Scottish wardens were largely local men which meant that there was a tendency for them to become embroiled in family feuds and long-standing enmities. On the English side of the border the wardens were appointed from further afield as well as from the local population. In addition to the wardens there was also a man appointed with the title Keeper of Liddesdale. This was a particularly thankless post as it involved administering the Debateable Land. A patch of territory approximately twelve miles by four that was home to the Armstrongs, Eliotts and Grahams – or in other words some of the most notorious men in the borders. It was here too that outlaws and broken men fled since it was neither Scottish nor English. Some of Liddesdale’s keepers seem to have been as much rogues as the men they were supposed to be keeping under control – The Fifth Earl of Bothwell and the Bold Buccleuch being two that spring immediately to mind. The wardens and the Keeper of Liddesdale were responsible for enforcing the March Laws and for seeing that justice was done. One of the ways of doing this was to hold a Truce Day where both sides met, bills of complaint were filed and trials held. The Ballad of Reidswire demonstrates that these meetings were not always altogether friendly! The Ballad of Kinmont Willie starts with a truce day at Kershopefoot where the English did not honour the truce to allow William Armstrong to return home. Click on the horseman to access further information about Wardens and Truce Days from Howard Pease’s 1912 text. 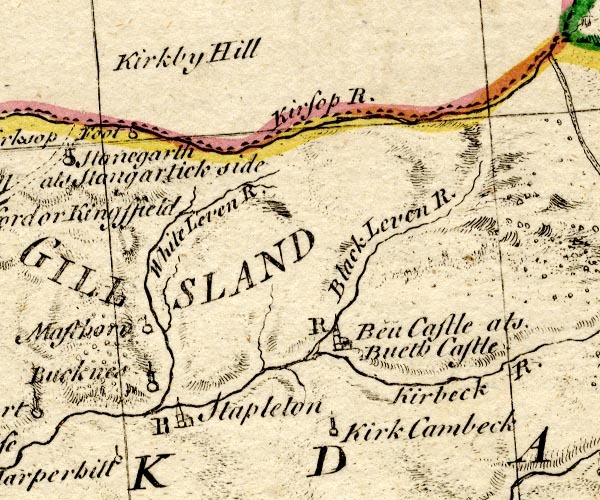 Map showing location of Kershopefoot. This entry was posted in Anglo-Scottish history, Border Reivers, Further Reading and tagged Debateable Land, further reading, Kershopefoot, map, marches, truce days, wardens by JuliaH. Bookmark the permalink.